Looking for options to enhance your concrete without resurfacing it? 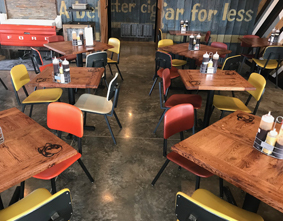 The versatility of polished concrete makes it an ideal flooring material for a variety of applications. Polished Concrete is concrete that has been mechanically ground and honed with diamond abrasives. There are multiple levels of polished concrete that range from a satin or honed appearance to a highly polished near mirror like shine. Because there is no coating to chip, flake or peel, its durability is second to none. Polished concrete can also be colored with dyes to create beautiful color tones in the concrete that simulate polished stone. This form of concrete finishing is quickly becoming the concrete floor of choice. 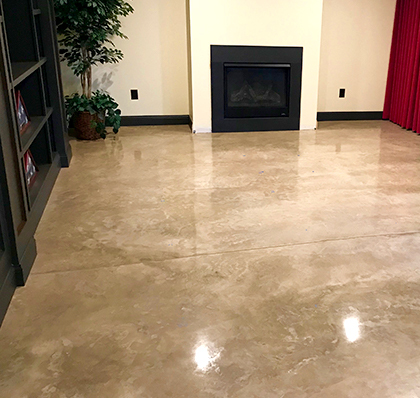 Whether you have a residential basement floor, or a commercial showroom let Customcrete help you pick the style and level of polished concrete to best fit your needs. Brings new life to old, discolored concrete floors. Available in wide variety of colors and designs. Polished floors are not vulnerable to damage like other materials. Traditional floor covering materials are not neccessary. Allows the floor to breathe and eliminates problems that occur when sealing off concrete. 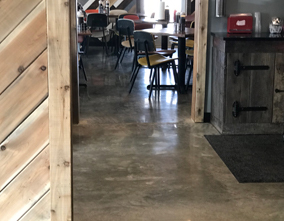 Polished concrete won't harbor dust, dirt, or allergens. The class grade indicates the density, size, and distribution of the aggregates (elements within the concrete that give it a dimensional, textured look) at the surface. Each class is customized within an indicated range to meet your design style. The chart on the right indicates the vary degree of manipulation for each class. 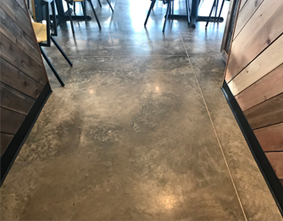 When selecting to polish your concrete, determining the level of gloss for your project is critical to the overall design aesthetic. At Customcrete, we have 4 levels of gloss to consider, each with their own unique benefits.